When you are looking to build muscle it is crucial that you have optimal testosterone levels as testosterone plays the main role in building muscle. Testosterone boosters are taken to increase testosterone levels and to free up testosterone in the bloodstream making it available for you to use for workout. 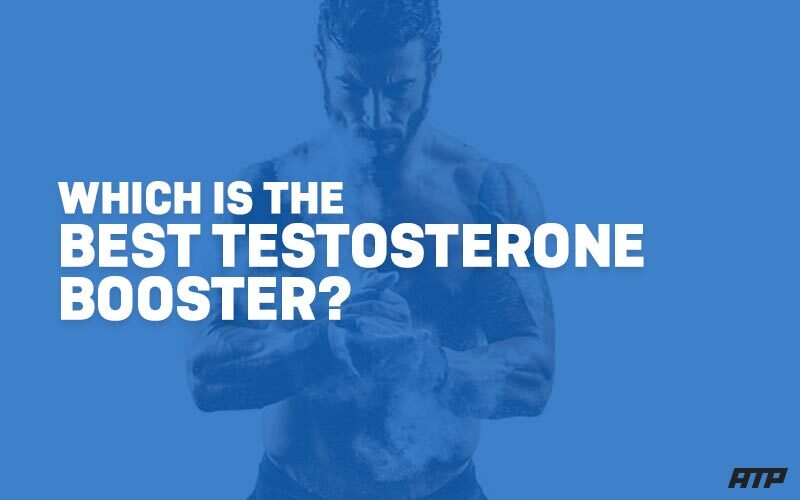 But, which testosterone boosters are effective? Testosterone boosters are a formulation with a combination of natural ingredients consisting of herbs, vitamins and/or amino acids. 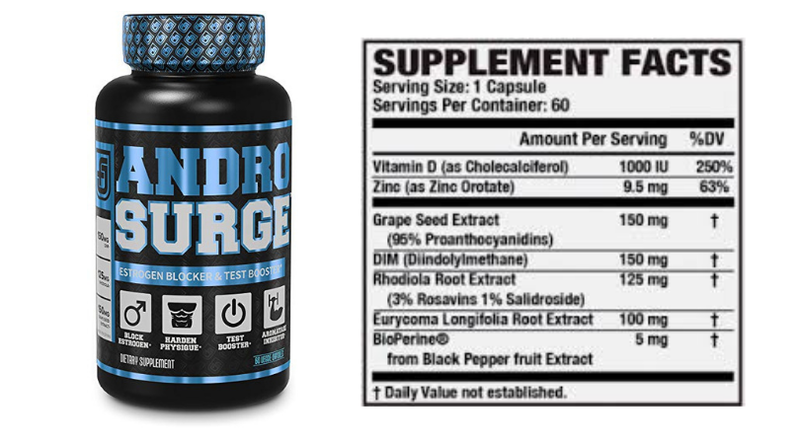 These ingredients work by increasing testosterone production and/or decrease estrogen conversion, making the naturally produced testosterone more available for the body to utilize during your a workout. Many of these natural ingredients have been clinically proven to provide results. Testosterone levels reach a peak at the age of 30 and thereafter they start to decline. There are many other factors that affect testosterone production that you might not be aware of. When To Take A Testosterone Booster? Increasing dosages over recommended dosage is not going to be make the product more effective. Try avoid consuming dairy when taking a serving of a testosterone booster to get the most results out of your supplement. What Ingredients To Look For In A Testosterone Booster? Diindolylmethane is broken down by the body from another compound known as Indole-3-Carbinol (I3C). This compound is a derived plant substance form cruciferous vegetables like broccoli, cauliflower, cabbage and brussels sprouts. Research suggests that DIM signals an enzyme that supports the metabolism of xenobiotics which may decrease estrogen levels. Your average diet gives about 2 - 24 mg of DIM daily. It is suggested to adhere to the recommended daily dosage as reports have said that sodium levels were lowered in certain individuals consuming dosages higher than 0.6 g of DIM. D-Aspartic Acid is naturally produced from a non-essential amino acid L-Aspartic Acid. This non-essential amino acid can be found in large amounts within and close to the hormonal secretion glands. Results has be presented that DAA is a highly effective amino acid that is regulator of testosterone synthesis. A recommended dosage of DAA is between 2- 10 g which can be take on daily basis. If you prefer to take 5g or more it is suggested to split your dosage up (before workout) and/or (before workout). A 3 week on 1 week off regime should be considered for best the results. Ashwagandha is a herb that is found in india and parts of africa. This herb has been used for centuries for the many benefits that it provides such as increasing testosterone levels. One of the most bioavailable forms of Ashwagandha is KSM-66. Dosages can vary depending on uses of the herb it is generally recommended to take 200 - 500 mg once or twice a day. Rhodiola Rosea is a plant that has many benefits such as increasing brain function , increasing energy level, decreasing stress level and may increase testosterone production. Recommended dosages range from 200 - 600 mg. It has been suggested to take a serving in the morning once a day. Eurycoma Longifolia is a plant also known as tongkat ali or malaysian ginseng. The plant offers many benefits such as improving sexual health, fat reduction, increase energy and stamina and to increase natural testosterone production. It is recommended to take dosages between 100 - 400 mg daily and should be cycled with a 6 weeks on 3 weeks off regime. Vitamin D3 is an essential vitamin to be supplementing with as studies have shown that a vast majority are vitamin D deficient. Vitamin D can also be produced naturally in the body when you are exposed to sunlight. A daily recommended dosage ranges from 400 - 800 iu and those that have a deficiency can take a stronger dosage that can range up to 5000 iu which should be consulted with a general practitioner before. Universal Nutrition has been on the market since 1977 which means they are one of the oldest yet most effective brands that are around. Animal Stak is well formulated and complete natural testosterone support supplement providing you with the results expected. Calcium D-Glucarate - Learn more about this ingredient here. RSP Prime-T testosterone booster is a scientifically formulated supplement to increase natural testosterone production as well as promoting healthy estrogen balance. 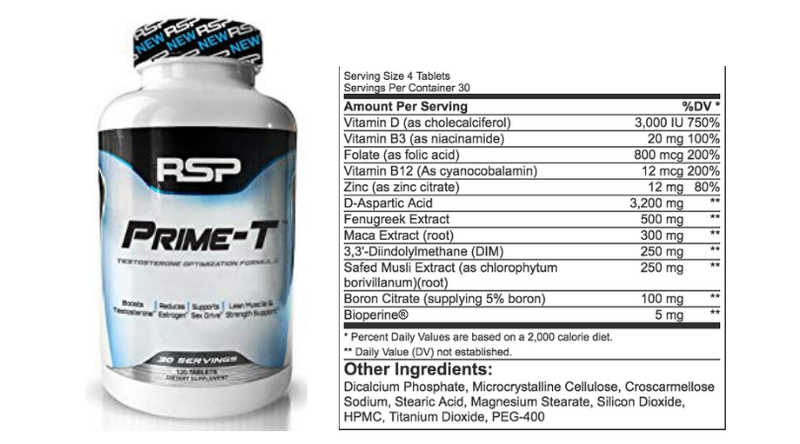 Every ingredient in RSP Prime-T has been dosed at scientifically proven dosages for effectiveness. RSP Nutrition products are manufactured in a GMP certified facility which thoroughly test products to ensure quality products. 250mg of Safed Musli Extract - Learn more about this ingredient here. Alpha JYM is manufactured by JYM Supplement Science which is a non proprietary formulation so you can see exactly how much of each ingredient you are getting per serving. 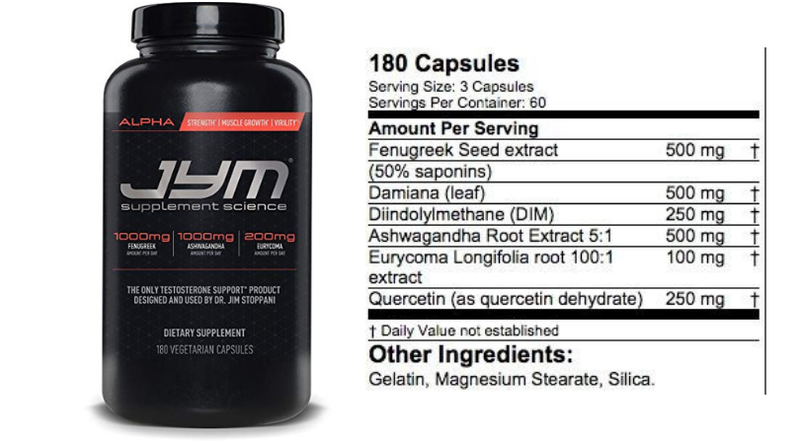 Alpha JYM is formulated with 6 ingredients based on scientific data published. Alpha JYM uses clinically proven ingredients at proven effective doses to provide an advanced testosterone booster formula designed to optimize your testosterone levels. 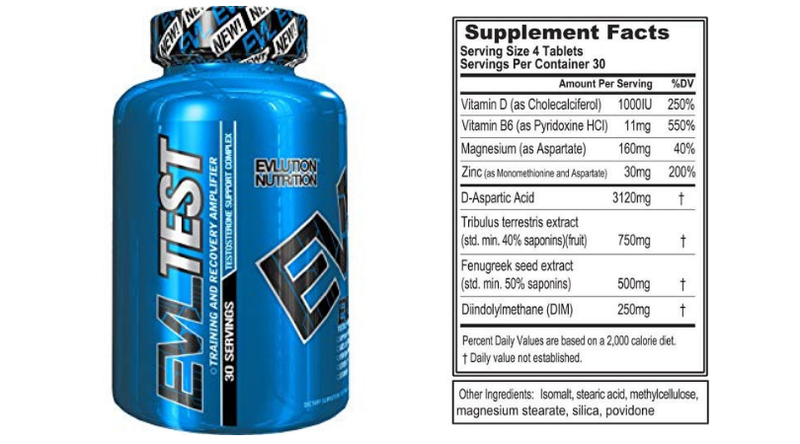 Evlution Nutrition is a new supplement brand to the industry that is based in Florida. Although they are new to the industry, but they are extremely popular and also have many positive reviews on a amazon. In conclusion, we hope the content that we have provided will help make your decision easier when shopping for a testosterone booster. 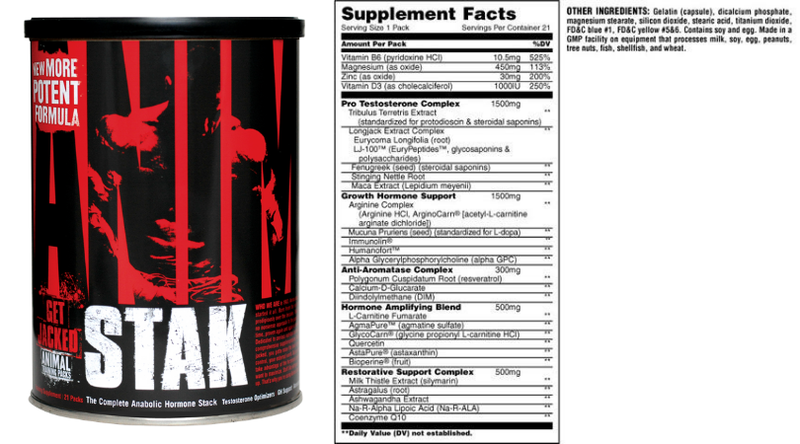 Our top choice has to be the Universal Nutrition Animal Stak, although it has a proprietary blend. Universal Nutrition provides high quality and effective ingredients that have been researched and have been around a long time and still competing with some of the other top testosterone boosters listed. To maximise results you could look at getting yourself a creatine supplement here to increase performance, strength output and decreased recovery time.